Mumbai Candid: Aagey Se Right! If you've stayed for over a month in Mumbai, you must've realized how hard it is to manage with or without the rickshaws! You can't survive without them cause they are supposed to be one of the most convenient modes of transport and you can't survive with them cause the most annoying lot of people have been given the responsibility of riding it. I have come across some of the worst and hence I'm compelled to share this post with our readers. Here are some categories that I have divided them into; they could fall into one or more of these categories. 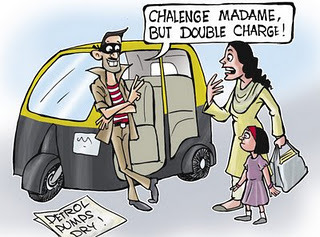 Tees Maar Khan: If without seeing the Tariff Card, the rickshaw wala tells you, the meter reading interprets to Rs 67, something is fishy. Make sure you pay only after re-checking the card, cause in most cases the guy is trying to con you. Mr.Google Maps: He will insist that he knows a shorter way to get to your destination, no matter how much you argue. What you should do is, be more persistent! Racer Pacer: He will cut lanes, speed up on roadblocks, pace into one-ways and disobey all kinds of traffic rules. He would rather believe in the phrase 'Time is money' over 'Better Late than Never'. The Newspaper: He will make conversations, give you gossip and will know everything that's happening in the world. From Bigg Boss to Kapil Sibal, he knows it all. Dear traveller, you're in for some good entertainment. Pichkaari: He slows down every few minutes to spit out his paan, supari, gutka and the likes. Sick and disgusting as he maybe, don't forget to remind him of social responsibility before you get off! Cow, Cow, Holy Cow: Especially when you're late, you will get this one. You would probably reach faster if you rode on a cow. As soon as you realize that, 30kmph is the fastest he can go, run for your life. Stop wherever you are and shift into a faster vehicle or you will actually have to witness bicycles overtaking you. The Lecher: He is the one with the multi-purpose rear-view mirror. He will occasionally adjust it, not to see the vehicles coming in from behind, but to get a better view of the passenger seat. Creeps, deserve a kick, where it hurts! Refusal King: Last, and clearly the worst. The number of times he would say no for your destinations would probably be more than the number of times a bollywood actress would, when confronted about her relationships. From excuses like, 'Gas nahi hai' to 'Rickshaw wapas dena hai', he would do anything to get away.